On this particular morning, I was working on one of Phoebe’s faves: avocado, pineapple, banana and yogurt “pudding.” I love storing her food in these weck jars if I’m keeping in the fridge, but if I’m storing anything longer than a couple days, I pop it into these Béaba Multiportion trays and place in the freezer so I always have something healthy ready-to-go at a moment’s notice. What does Phoebe like? Well, so far, pretty much everything. I know, I know, some kids are naturally more picky than others, but one thing I’ve tried to do since she first started eating purées (at 6 months) is to give her a chance to try flavors multiple times even if she doesn’t like them at first. The first time she tried avocado, she squished up her face and refused to take another bite. But I tried feeding it to her again a few days later with a touch of salt and lime juice (baby guacamole!) and guess what? Loved it. Ditto with chicken, white beans and banana. Sometimes kids just need a few tries before they get used to a new flavor and acquire a taste for it, you know? 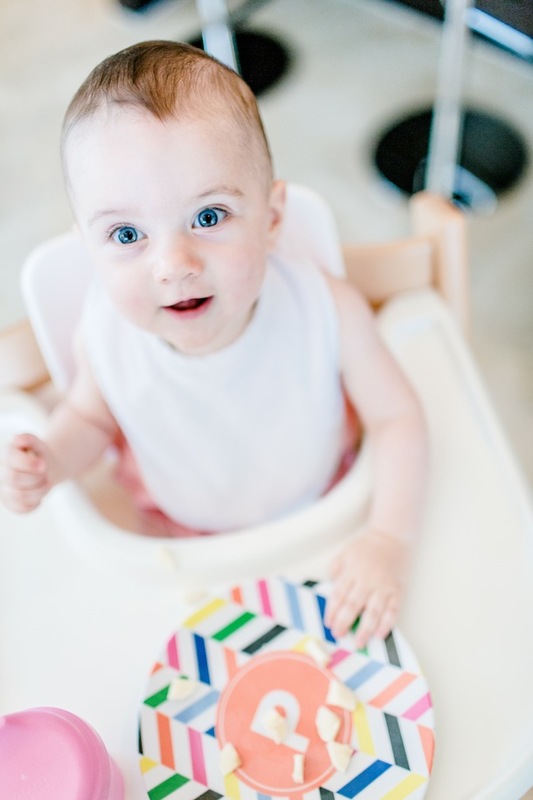 My friends Morgan and Carrie design these darling monogrammed melamine plates, which make P’s mealtimes a little more colorful, and most importantly, unbreakable. I’ve run them through the dishwasher countless times and they haven’t lost any of their luster. Other mealtime essentials? Tons of simple white bibs, pink sippy cups for water and these Beaba spoons. Phoebe and I inevitably end up eating a different version of the same flavors. On this morning, I threw slices of avocado, blueberries, banana and kale into the blender with coconut water for my own breakfast smoothie. For each of these “recipes,” the technique is basically the same. Wash, peel and chop the produce, then either cook or use raw as noted below. If I’ve called for a vegetable to be roasted, spread 1″ pieces on a parchment-lined baking sheet and roast at 425 degrees for about 30 minutes until tender and caramelized. 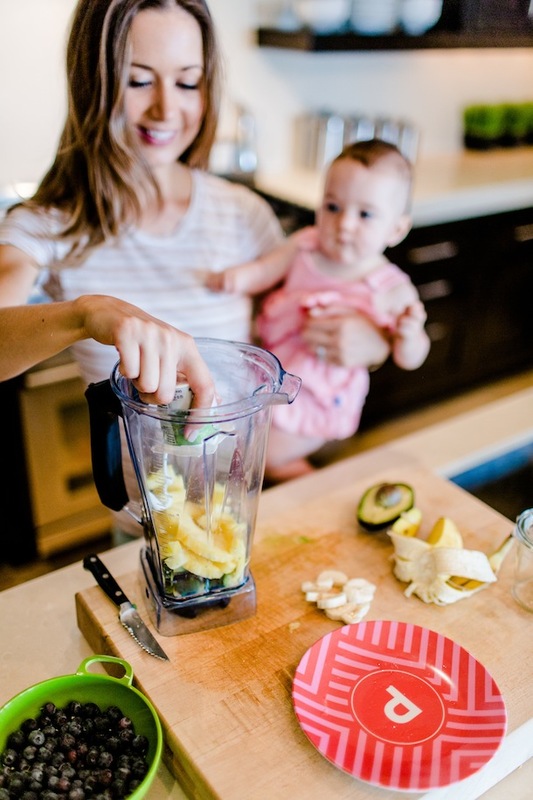 Most of these purées require a little liquid to get them smooth – add water to the blender a little at a time until the mixture is the consistency you’re looking for (older babies can tolerate chunkier food.) You’ll notice that I don’t list amounts: this isn’t the time to worry about being overly exact. Just play with the proportions until it tastes good! Popeye Mix: Blueberries + Apricot Slices + Raw Spinach. Add a touch of agave syrup if the fruit isn’t super ripe. Squash ‘n Grains: Roasted Butternut Squash + Cooked Quinoa + a pinch of kosher salt and cinnamon. Sweet Pea Hummus: Frozen Peas (thawed) + 1/2 clove peeled Garlic + Tahini + squeeze of Lemon Juice + pinch of Salt & Cumin. White Bean Purée: Cannellini Beans (from a can, rinsed & drained) + 1/2 clove peeled Garlic + Lemon Juice + a few leaves Italian Parsley + Olive Oil + pinch of Salt & Black Pepper. 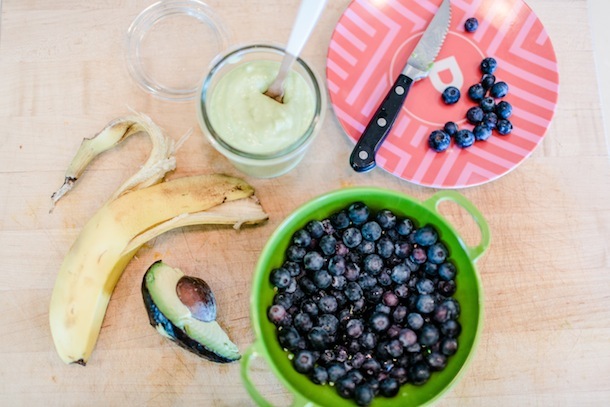 Tropical Avocado Pudding: Banana + Avocado + Pineapple + Whole Milk Plain Yogurt. Figgy Pudding: Chopped Figs + Roasted Pears (peel first) + Fresh-Squeezed Orange Juice + a touch of maple syrup. Green Machine: Kale + Peach Slices (peeled) + Whole Milk Plain Yogurt + a squeeze of agave. Just Beet It: Roasted Beets + Cooked Farro + Goat Milk Yogurt + a pinch of salt & squeeze of agave. Wow! You have put so much thought and care into Phoebe’s diet! I really appreciate that you have her taste things multiple times before just deciding she doesn’t like it and won’t eat it. That’s a huge deal…now she won’t go through life as a picky eater! 🙂 Oh, and I really want to try this baby food (never thought I’d say that)! I love the pink sippy cup, but the URL doesn’t seem to be working. Could you please provide the brand name? Thank you! We have the OXO one and love it, was just drawn to the pink one you displayed. Thanks for letting me know they leak. Great recipes. I love to take my home-made baby puree and turn them into popsicles for the kids, great for summer! What an adorable photo shoot! I love that you’re taking such great care in what Phoebe eats. Good work!! What a lovely post Camille! Inspiring, and I don’t even have kids… I’m tempted to make myself the smoothie you have for breakfast though! It’s really good, and perfect for morning’s on the go when you still need something semi-substantial! aww, thanks Bek – Phoebe sends kisses!! 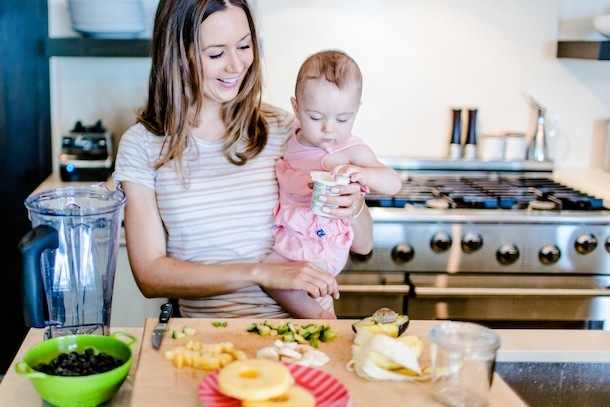 Not only are you providing a very healthy diet for your beautiful baby girl, but you are opening up a whole world of enjoyment by exposing her to a rainbow of foods. I’ll bet she has a very strong immune system……..and those blue eyes are dreamy! That is so true. 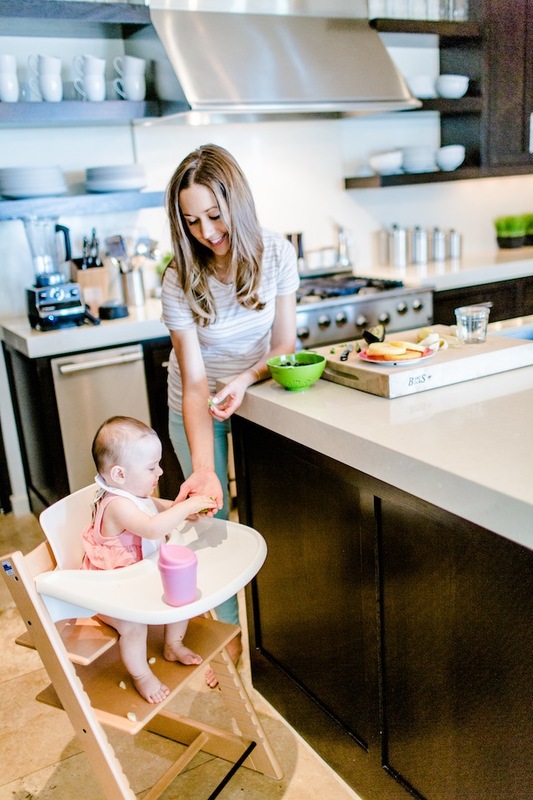 I try to feed myself so many illness-fighting antioxidant-rich nutrients, I definitely feel good doing the same for my baby girl! And thank you… we do NOT know where those blue eyes came from (her grandfathers??) but we certainly love them. I love love love this post, Camille! Not only because seeing Phoebe make a cameo on the blog always makes me happy 🙂 But mostly because I love how much thought and common sense you’re putting into her diet. I think there’s no better time to teach a kid to appreciate different flavors and bland, tasteless baby food is simply horrid (I used to work as an au pair in France, and I had a taste, or three, of those disgusting little pots). I don’t have kids yet, but when I have them one day, I will probably pick your brains (and go over your archives) for inspiration. You’re such a fabulous and inspiring woman! Thanks so much Ivana – YOU are so inspiring and encouraging, and your kind words mean so much to hear! And you’re right about those jars of baby food… if I can’t bring myself to eat them, why would P want to either?? 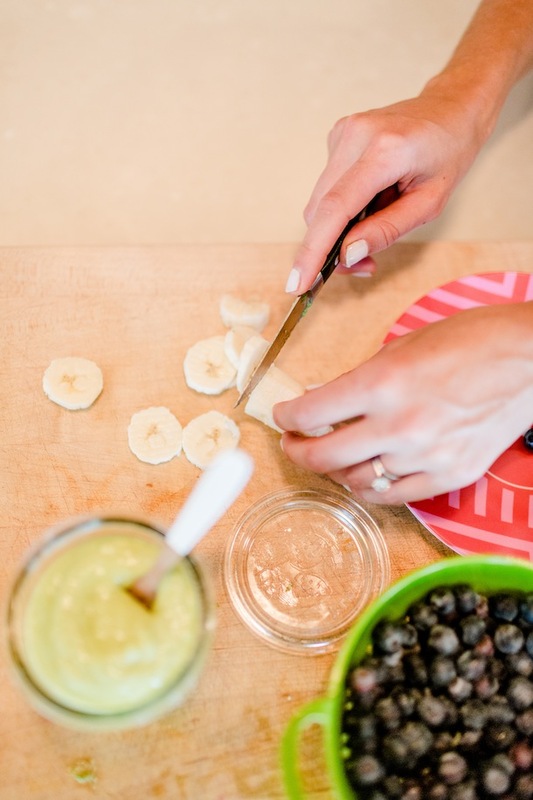 Of course, sometimes convenience has to win out and I’m definitely not a “homemade baby food nazi,” but thankfully I usually have something yummy stored in my freezer for the really busy days. Love, love, love this post- agree with a previous comment that it’s my favorite one thus far! We are getting ready to jump into the next chapter of eating [solids] with our soon-to-be-six month old. I plan on making his food, and reading this made me so excited to introduce him to a wonderful world of new flavors. It really is so much fun… definitely takes a bit more time and patience, but sometimes in the midst of a busy day, I welcome the opportunity to step away from work/email/phone and slow down to make her food and then help her eat it. I know I’m an adult, but I might have to steal the Popeye and Just Beet It recipes for on the go breakfasts! Love this post! I’m a personal chef who just started nannying when my client had her baby, and we just started introducing foods this week! Can I ask you, when you introduced each item first, how long did you try it out before changing to another fruit or veggie. 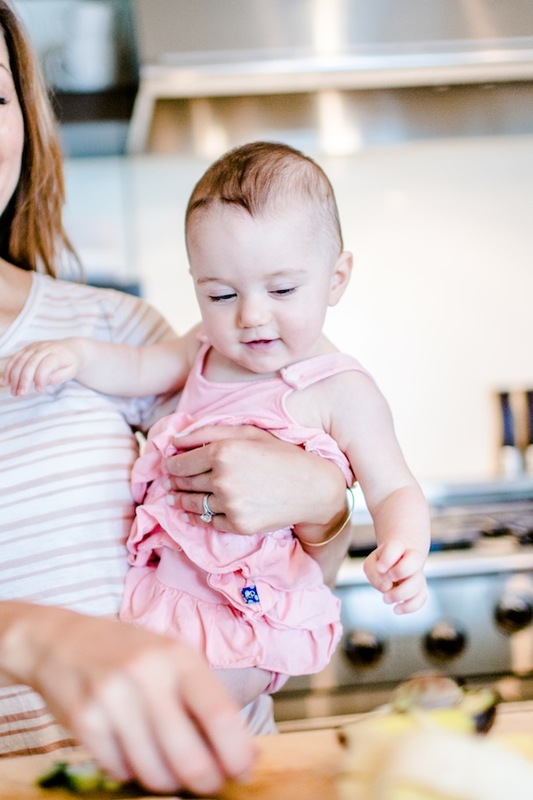 All the baby cookbooks i’ve read say 3-5 days, but we’ve got some people in the family who say “i’ve been taking care of babies for thirty years, and it’s always been a week.” I feel that the sooner we can start mixing the flavors, the better appetite baby will have. Just to make the recipes you’ve listed above, it would take moths if we added one new ingredient every week. The baby guacamole alone would take three weeks!! I would love to have your opinion, because making sure baby Julian is an adventurous eater only makes my job easier as his family chef! Thanks! I think you’re right on, Erika. Your client’s family is so lucky to have someone like you who puts so much time and consideration into the baby’s development!! This kind of posts are taking a new meaning for me, as I’ve just learned that I am pregnant with my first child (complete surprise, may I add). It’s too early to shout it to the world, but nevertheless, I look forward to our own beautiful traditions and memories. Oh my gosh, congratulations to you! So very exciting…. I can’t imagine what a surprise that must have been if you weren’t planning for it, but you are in for the best adventure. You’ll never be able to imagine life without him or her again! I’m not a momma but this was so cute! Ps..I love your pants! Honey bear looks so introspective in that second photo! My nearly-8-month-old still hasn’t taken to solids yet (of course, everything else she gets her hands on goes straight into her mouth, but she wants NOTHING to do with food) – but I love that you’ve adopted a healthy (and varied!) meal plan for Phoebe. I’m inspired to blend up some of your creations for my little girl when she finally comes around… Love this post – thanks! Perfect timing! We are about to start Emerson on solids- I can’t wait to try these combinations and find out her favorites! They all look delicious! Camille, Phoebe is one lucky little girl with all that beautiful wholesome food (and a mama who cares about the dirty dozen). I have to get Niamh into smoothies at some point. Seriously, I am so inspired…and I don’t even have children yet! What a wonderful tradition and way of life to introduce to Phoebe. Thanks for sharing! Love the post AND love the high chair. We’re in the market for our Mia and would like to pick up a similar one. Can you tell me where you got it, or the brand name? Thank you so much for sharing this! My little guy is 5.5 months old and I’m a sort of freaking out about what to feed him when we hit 6 months. These are awesome recipes! Do you use dried apricot slices or fresh? I used fresh apricots… so this is really a spring/summer recipe. 🙂 You guys are going to do great – have fun with it. No freaking out necessary! hi! clicked over through pinterest! Those gold and white spoons are beautiful! where are they from?? They’re actually wood, with handles dipped in white. From Anthropologie! Thanks Janessa! Please stop using agave syrup. It is very high in fructose, it can deplete minerals in the body and stresses the liver. Do some research on it. It’s not the ‘superfood’ we’ve been lead to believe it is. If you must use a sweetener, try organic coconut nectar (not palm sugar!) – it’s rich in minerals and amino acids, and low in fructose (only 10% compared to agave’s 97%) or at worst, some organic maple syrup. Love these images and how you combine the old with the new flavors. It’s wonderful to see the vibrant colors of fresh whole foods and to know that these foods retain their nutrients to better nourish your baby. I’ve come back to this post time and time again as I’m beginning to introduce solids to my daughter. What size weck jars do you use for storage? Thanks for the wonderful baby food ideas, I was starting to run out of fun new combos for my 9 month old. When did you introduce agave? I was trying to do some research, but there is not alot of information about it. My 10 month old has an incredibly sensitive gag so solids have been a fairly rough experience for us. Today I felt defeated and felt as though I have nothing figured out. Coming across your post, however, made me feel hopeful and optimistic. You have a beautiful attitude toward parenting and you have inspired me to do the same. Do you make these recipes in bulk and freeze, or just make each serving of what you have on hand that day? Definitely freeze in portion-size amounts, so I always have some ready to go when I’m in a rush! How do you thaw the portions? I’m doing the same thing but its taking forever for things to thaw out! Salt and syrup are big no no’s. Thanks for your input Johannes… I am definitely in the camp that believes that, even for babies, the key words are “just a little!” when it comes to these ingredients. They undeniably enhance the flavor experience of vegetables, and I definitely think they’ve gone a long way in helping Phoebe prefer all kinds of super healthy foods. 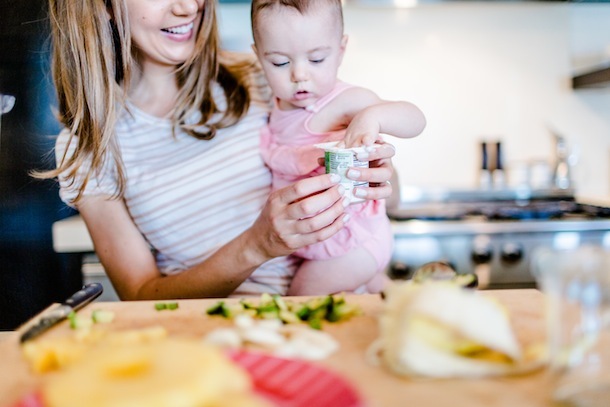 There hasn’t been evidence that babies process these two particular ingredients differently than adults… and I believe that moderation is key for all ages. This is AWESOME! I have an almost 6 month old and can’t wait to try all kinds of hhomemade purees w her. She already wants to eat everything so I think it wikl be fun! My 4 year old will love too! Awesome post!!! Where did you find that cute spoon in the last photo? Or did you DIY it? Thanks Jessica! The spoon is from anthropologie! I also really like the cute spoon, and it’s really awesome to make food for your little one. Great job. I’m so excited to try making baby food in a few months! I’m wondering though how you know what foods you need to cook before you blend and refrigerate or freeze? This is a good question! As a general rule, I’d say to cook anything that tastes better after being cooked (like butternut squash), and use anything raw that’s typically eaten that way (like berries.) Some of the items can go either way… raw apple can certainly be added to a powerful blender and be delicious, but I’ve found that Phoebe usually prefers the taste of it when roasted, because it brings out the sweetness. Definitely not an exact science though, and every child has his/her unique preferences, so just start experimenting and have fun! Thanks for the posting – really great. Would feed an 6 months old. I am a new mom and not really sure about the schedule. He is pretty big for his age so ut sure how often I should give him solid food at the beginning. I do breastfeed him at least 10 times a day. Thanks. Looking forward to hearing from you. Did you start your little one on cereal at 6 mths of age? 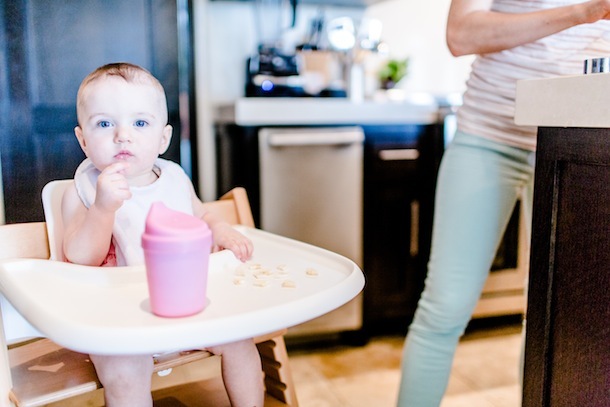 Yes, around 6 months we did single vegetable purées and oatmeal… she didn’t eat more than a couple of spoonfuls, but at that time, it’s really just about getting them to taste it! Breast milk or formula should still make up the bulk of their diet at 6 months and provide all the nutrients your baby needs. Another question which model of the Vita Blender do you have? Any recipe books for baby could you recommend? I have the Vitamix Professional Series, but I think that any of them will work just as well for these purposes! And I love Tyler Florence’s Fresh Starts for great, healthy food for your kids ages 6 months to teen! Thanks for the quick reply!! I have a few more last questions for you…What size of Weck Jars did you use? I went out and bought that book today! Thanks Great Book! Also did you make your own oatmeal cereal or did you buy the packages of baby oatmeal cereal? If so what brand did you use? Did you buy organic? Great ideas! 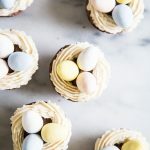 Thanks so much for sharing these recipes! I love your baby related posts; I would love to read about what activities you do with your little one, your favorite places to shop for her, etc.! Would you be able to let me know what size of Weck jars you used?? I’m having a hard time picking the size that will work. Can you let me know what size you used and how you used them? Hi! I am super excited to be introducing my boys to foods now! I’m a dietitian, so I’m on board with all of the fresh and organic ingredients you’re using. Thanks for the great combination ideas. I think kale might be next! How did you store your homemade baby food in the freezer? Did you use the Weck jars or ice cube trays? Great post! So inspiring! My little girl was recommended to start solids at 4 months (we live just outside of Switzerland so the recommendations are a little different :), so now at 6.5 months I’m getting a little bored of our current combos, so I imagine she is as well. Can’t wait to dive into some of these flavor combos. Question about the Figgy pudding: do you use dried figs, fresh figs, or does it just depend on what you can get at the time? do you puree the quinoa when you mix it with the squash? You should never give babies salt. Hi, great post and they all look super good! I am wondering though, if it is all getting thrown into the blender is it necessary to roast and peel? Yes, roasting the vegetables definitely brings out the natural sugars (and yumminess!) and also helps make the food more easily digestible for baby. Great question! Wow! This is so awesome and encouraging. My son Jude is six months and I am just entering the world of making baby food and it is a tad overwhelming. Would these recipes be suitable for a six month old? It never hurts to try! 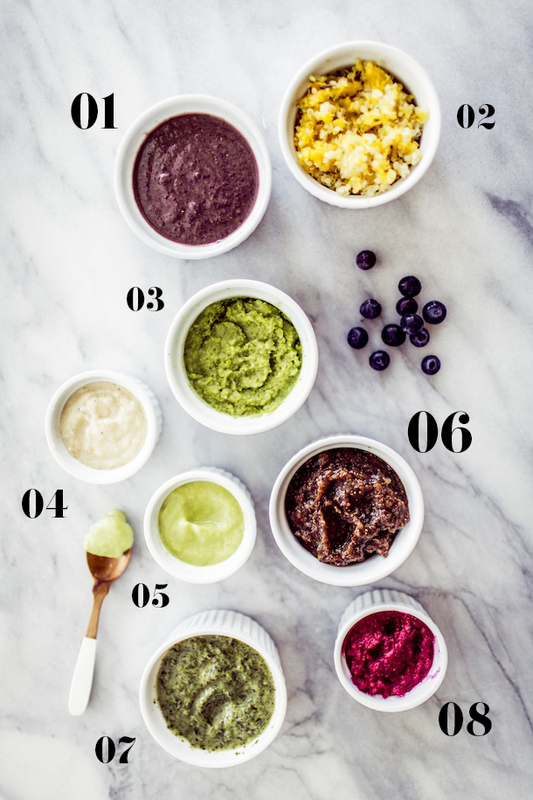 I would definitely start with single-ingredient purées, and as your baby starts adjusting (and showing preferences) to those single flavors, then you can move on to combining different flavors together. Good luck and have fun! Hi! I tried the tropical pudding & my son loves it! Can you freeze it? I have quite a bit made & don’t want it to waste! Thanks! I currently have a 6 month old and have been introducing various fruit and vegetable purees since 4 months. I am trying to make my baby girl into a mini-gourmand, too, and was wondering if you had tips for what Phoebe was eating around this age so I know what to introduce.